Basically, there are functional app-specific CALs such as the CCM Data Collector, QM Data Collector, RQM Connector, Build System, CQ Synch, and CC Synch that used to be packaged with the Required Base License Keys Including Trials package that was installed by Installation Manager along with the JTS and the CLM server packages prior to v4.0.1. In version 4.0.1, a change was made to rename this license package as well as to move these app-specific functional CALs to be contributed by their respective CLM server applications. For example, the CCM Data Collector, CQ Synch, Build System and CC Synch CALs are now being contributed only when the CCM (4.0.1 or greater) server package is installed. Thus, let’s say that you are planning an upgrade from v3.0.1.4 to CLM v4.0.1 and have a distributed CLM deployment with a JTS, CCM and a QM application. You start by staging an upgrade of just the JTS and CCM applications. So, you install the JTS and CCM 4.0.1 install in their respective locations so that you can perform a side by side upgrade. In v4.0.1, the license package is called Trial Keys for Collaborative Lifecycle Management Products. It only contains the Trial licenses. The other licenses needed are now contributed by the applications themselves. Thus, if you upgrade only JTS and CCM to v4.01 and leave QM at v3.0.1.4, you will have some license assignments that refer to licenses that no longer exist such as the QM Data Collector or RQM Connector. This is because QM is still at v3.0.1.4 and these licenses will not be provisioned until QM is upgraded to v4.0.1. If you upgrade all the apps at once, this is not an issue. This is only an issue for staged upgrades. What is being done about this problem? A zipfile containing all of the 4.0.x functional CALs is being made available via workitem 251460 above that can be installed via the JTS Admin web UI after the JTS is upgraded. This will allow these functional CALs to be persisted in the database. At the time you subsequently upgrade any of the apps such as CCM, QM or RM, all the functional CALs associated with the application would need to be deleted. This is necessary so that the new CALs contributed by the upgraded app will take effect rather than the ones persisted in the database. Why do we need to install these 4.0.x functional CALs in the first place? These functional CALs are assigned to functional users. Since they are now contributed by the applications, once the JTS is upgraded, the older functional CALs are removed so you end up with functional user CAL assignments to licenses that do not exist. This causes problems with the operation of the non-upgraded applications. Why do we need to delete these 4.0.x functional CALs prior to upgrading a particular application? If they are not deleted, then these functional CALs persisted in the database repository will take precedence over any CALs contributed by the upgraded app. This is not the state we want to have. I recently had the opportunity to help some of our client technical professionals overseas get familiar with the Rational Lifecycle Integration Adapters (RLIA) – Standard Edition. This included some install and configuration sessions and some exercises to help them understand the key features. But, I was missing some information on how to install and configure the GIT Adapter. It is documented in the RLIA v1.0 infocenter, but sometimes it’s better to see it broken down into some simple steps with notes and then run through it oneself. So, that’s what I did when I got back to the office. I just had to see how to get to the point where RTC and GitWeb were integrated. I’ll take you through what I did to get RTC 4.0.1 and GitWeb integrated such that I could link Git commits with RTC workitems. CLM 4.0.1 deployed on Tomcat with a Derby database and the Money that Matters sample. Administrator privileges are required to install the adapter. If your CLM 4.0.1 public URI does not contain a port, please contact IBM support to obtain a hotfix for the Rational Adapter for Git that will work in your environment. The Git adapter needs to be installed into the same location as Jazz Team Server (JTS). For example, if you want to integrate with a specific instance of the RTC 4.0.1 application, you need to figure out what JTS that RTC 4.0.1 application is registered with. Stop the CLM 4.0.1 server. Locate the Rational Lifecycle Integration GIT Adapter install directory, GIT\disk1, of the installation media. Run launchpad.exe to install the adapter into the same application server instance as the JTS. After adapter install completes, start the CLM 4.0.1 server. When I ran through this part, I got a message during Step 7 regarding having to upgrade the data warehouse. I skipped this step by selecting the checkbox, ‘I do not want to configure a data warehouse at this time’. Development said it was ok to do this and that this was not the expected behavior. It should have just worked. In Step 5, I also let it create a default functional user, gitAdapter_user. After the adapter application is registered, we can proceed to configure linking between the RTC application and the Rational Adapter for Git. This part is pretty straightforward. It involves establishing a friend relationship between the Rational Adapter for Git and RTC. Open the JTS Admin page in a browser. Create a user called ‘githook’. Apply a RTC Contributor Client Access License (CAL). Add this user as a member of the RTC projects that you want to integrate with Git using this adapter. This part can be automatic if you are logged in as a CLM Administrator like I was. You get the option to grant provisional access. However, there is a part that is not quite documented well and is mentioned in passing in Step 7. It discusses a functional user ID that needs user privileges to update workitems and permissions in the RTC project area that will be used by this integration. But, it is the first time this is mentioned. That is the reason I had you create a user, ‘githook’ in the previous section. Open the CCM Admin page in a browser, for example, using a URL such as : https://clm.jkebanking.net:9443/ccm/admin using an account with administrator privileges. Navigate to the Consumers (Inbound) page. Locate the consumer relationship in the Authorized Keys section. Follow steps 6 and 7 of the infocenter topic listed above to add the githook user to this consumer key. Note: There is no functional user associated with this inbound consumer. This is where we want to add the ‘githook’ user we created earlier. This part is done where GitWeb is installed. The GitWeb additions add a banner to the GitWeb interface that supports: (1) the creation of links between commits and RTC workitems, (2) traversal of existing links and (3) rich hover support of existing links. Follow the instructions in the topic above. In Step 4, follow the suggestion to copy/paste the contents of gitweb.conf.README to the gitweb.conf file for your installation. Once this section is complete, you should see the following banner when opening GitWeb. Now that we have the Rational Adapter for Git banner installed, we will use it to register the Gitweb server with the adapter. This step will allow to the Gitweb server to be recognized by Gitweb objects. Make sure to follow Step 6 which further updates the ./static/oslcConfig.js file. We can now finish the configuration by registering one or more Git projects with the Rational Adapter for Git. Take a note of Step 8. If you want to configure the ‘commit hook’ piece of the integration, you will need to record the Gitweb project URI. You can retrieve this Gitweb project URI at a later time however by going to the Git Adapter Appication Administration page (https://<publicURI>/gitAdapter/admin) and selecting the Git Server connection entry ID hyperlink. Here is a preview on how to get started. The examples below will cover how to discover the root folder and navigate the folder structure of a RM project, create a folder and how to create a requirement in that new folder. At the end, I will mention briefly how to move a requirement from one folder to another. This information will be incorporated into an updated version of the OSLC workshop on Jazz.net, so stay tuned for that for some sample code. Note that in all the examples below, I do not discuss the request header. The request header must contain OSLC-Core-Version=2.0 and Accept=application/xml (where applicable). A GET on the service provider URL for a project yields a number of services, one of which is the query capability. With RRC v4.0, there are now 2 entries returned for query capability. One of them is the Folder Query Capability URL. The folder query capability URL is the way to discover the ‘root’ folder of the RM project. The above folder query capability URI allows you to retrieve information about the root folder and discover attributes that will allow top down navigation of the folder structure. This response body contains the top level folders of this RM Project: JKE Private Banking and Securities Project , JKE Enterprise Project, and JKE Business Recovery Matters. Each folder contains a nav:subfolders element which is that folder’s query URL. Use that URL to discover any subfolders. Each folder has its own unique identifier which is found in the rdf:about attribute of the nav:folder element. It is this attribute that will be used in our next section to identify the parent folder of a new folder. Now, let’s create a subfolder in the folder ‘JKE Business Recovery Matters Project’. We just need to provide a nav:parent element to our POST request body to indicate where we want the folder created. 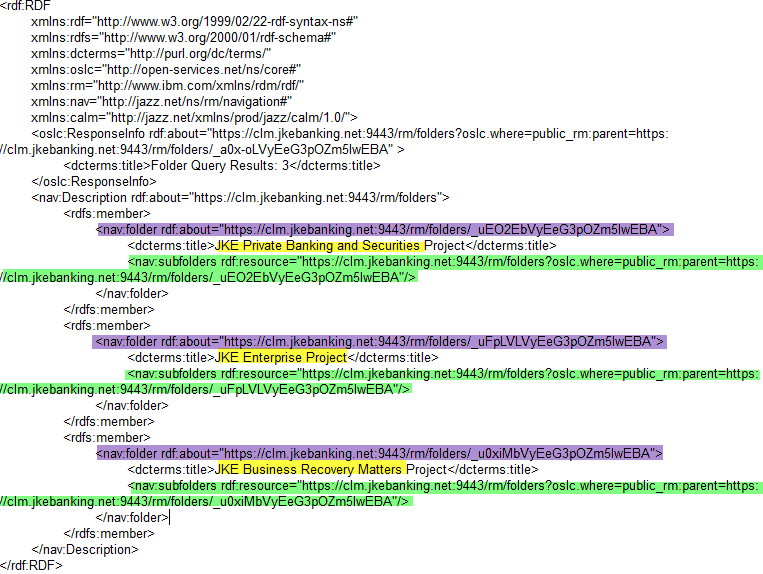 In our case, we need the nav:parent element to point to the folder URL of the ‘JKE Business Recovery Matters Project’ folder. That was obtained at the end of the previous section using the rdf:about attribute of the nav:folder element for the ‘JKE Business Recovery Matters Project’ folder. After the POST, you can get the folder URL of the new folder from the location field of the response header. You can also confirm via the RRC Web UI Artifacts page that there is a new folder, ‘My First OSLC folder’, created under the ‘JKE Business Recovery Matters Project’ folder. Next, I want to create a requirement in this new folder. Requirements can be created using the Requirement Creation Factory URL. I can find that URL by doing a GET on the services provider URL for my RM project. We did that earlier to locate the Query Capability URL. Next, construct the requirement creation request. Grab one of the resourceShape URLs and use it as the instanceShape rdf:resource. To specify a folder for this requirement, add the nav:parent element and provide the folder URL in the rdf: resource attribute. How do you find the folder URL? At the end of the previous section, it was part of the response header. If it was not saved, then simply do a GET on its parent folder query URL, and parse for the name of the new folder in the query results. Once the nav:parent element value has been located, use it to complete the content for the new requirement. Here is the complete content to send in the POST request body. To create this requirement, do a POST to the requirement creation URL with the above POST body. The location field of the response header will contain the URL of the newly created resource. To move a requirement from one folder to another, you simply have to update the nav:parent element of the requirement using a PUT. We cover updating a requirement in Example 4 of the OSLC workshop. Locate the folder URL of the new folder you want to move the requirement to. Update the rdf:resource attribute of the nav:parent element. The rdf: resource attribute of the nav:parent element is what contains the folder URL for a requirement resource . Here is a the XML for a requirement resource. Notice the highlighted nav:parent element. There are a few tools that are useful when working with the OSLC API. Here are some links. CLM 2012 is coming. Are you ready? So, what am I up to now? I’m busy testing and helping to document the upgrade to CLM 2012, of course. I started thinking that there are things CLM customers could be doing now to get ready to upgrade to CLM 2012. Why not blog about it? So here goes….. The Jazz.net development wiki contains some drafts of the upgrade process. Review it to start getting familiar with the process. Remember that this is all pre-release and subject to change. The official upgrade process will be in the 4.0 infocenter. Since I have joined the IBM Jazz Jumpstart team, I’ve been encouraged to start this blog. This will give me the opportunity to share tips and tricks with you that will help you make the best use of IBM Rational’s Jazz suite of products. In particular, I am excited about the upcoming release of our Collaborative Lifecycle Management (CLM) solution, version 3.0.1. You can get more information and get just as excited by visiting the central location for ‘all things Jazz’: a.k.a Jazz.net. This new release will simplify the way Rational Team Concert, Rational Quality Manager and Rational Requirements Composer (the 3 original Jazz-based products) work together to help teams improve their productivity across the application lifecycle. My initial focus will be on the following topics: Upgrade, RRC v3.0.1 new features and the Reporting capabilities built-in to the CLM solution.